For a broader coverage of this topic, see Typography. The photographic paper or film is fed into a processor, a machine that pulls the paper or film strip through two or three baths of chemicals, where it emerges ready for paste-up or film make-up. Phototypesetting machines project characters onto film for offset printing, in 1949 the Photon Corporation in Cambridge, Mass. 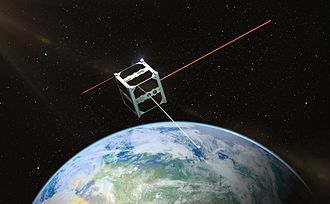 Developed equipment based on the Lumitype of Rene Higonnet and Louis Moyroud, the Lumitype-Photon was first used to set a complete published book in 1953, and for newspaper work in 1954. 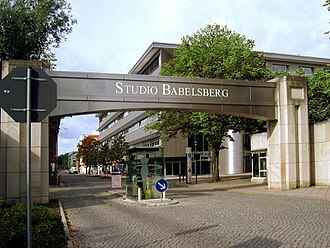 Mergenthaler produced the Linofilm using a different design, and Monotype produced Monophoto, other companies followed with products that included Alphatype and Varityper. This cold-type technology could be used in environments where hot-metal machines could not. The use of phototypesetting grew rapidly in the 1960s when software was developed to convert marked up copy, usually typed on paper tape, to the codes that controlled the phototypesetters. To provide much greater speeds, the Photon Corporation produced the ZIP200 machine for the MEDLARS project of the National Library of Medicine, the ZIP200 can produce text at 600 characters per second using high-speed flashes behind plates with images of the characters to be printed. Each character has a separate xenon flash constantly ready to fire, a separate system of optics positions the image on the page. An enormous advance was made by the mid-1960s with the development of equipment that projects the characters from CRT screens, alphanumeric Corporation produced the APS series. Rudolf Hell developed the Digiset machine in Germany, the RCA Graphic Systems Division manufactured this in the U. S. as the Videocomp, marketed by Information International Inc. Software for operator-controlled hyphenation was a component of electronic typesetting. 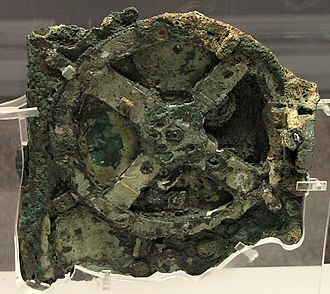 Early work on this topic produced paper tape to control hot-metal machines, C. J. Duncan, at the University of Durham in England, was a pioneer. Berthold successfully developed its Diatype, and ADS machines, Compugraphic produced phototypesetting machines in the 1970s that made it economically feasible for small publications to set their own type with professional quality. One model, the Compugraphic Compuwriter, uses a filmstrip wrapped around a drum that rotates at several hundred revolutions per minute, the filmstrip contains two fonts in one point size. Agfa-Gevaert N. V. is a Belgian-German multinational corporation that develops and distributes analogue and digital imaging products and systems, as well as IT solutions. Agfa Graphics offers integrated prepress and industrial inkjet systems to the printing, Agfa HealthCare supplies hospitals and other care organisations with imaging products and systems, as well as information systems. Agfa Specialty Products supplies products to industrial markets. It is part of the Agfa Materials organization, in addition to the Agfa Specialty Products activities, Agfa Materials supplies film and related products to Agfa Graphics and Agfa HealthCare. Agfa film and cameras were once prominent consumer products, however, in 2004, the consumer imaging division was sold to a company founded via management buyout. AgfaPhoto GmbH, as the new company was called, filed for bankruptcy after just one year, the brands are now licensed to other companies by AgfaPhoto Holding GmbH, a holding firm. Following this sale, Agfa-Gevaerts commerce today is 100% business-to-business, headquartered in Mortsel, Agfa has sales organisations in 40 countries. In countries where Agfa does not have its own sales organisation, at the end of 2011, the company had 11,728 employees worldwide. Agfa has manufacturing plants around the world, the largest production and research centres are based in Belgium, the United States, Germany, France and China. Net sales for 2011 totalled 3,023 million euros, Agfa is organised into three business groups as follows and analogue prepress systems and consumables. Consumables, graphic film and digital printing plates and Jeti printer families, typically used to produce posters and displays. M-Press family high-end flatbed presses, designed to replace traditional equipment for all possible screen printing jobs, developer of medical imaging information systems. Agfa Healthcares main offices are in Mortsel, Waterloo, Vienna, PACS for cardiology IT and CardioVascular Information Systems. Agfa Specialty Products supplies products to a variety of industries, traditional film products Sound recording film and print film for the movie industry. William Caslon I, known as William Caslon the Elder, was an English typefounder. The distinction and legibility of his type secured him the patronage of the printers of the day in England. His typefaces transformed English type design and first established an English national typographic style, Caslon was born in Cradley, Worcestershire in 1692 or 1693 and trained as an engraver in nearby Birmingham. In 1716, he started business in London as an engraver of gun locks and barrels, having contact with printers, he was induced to fit up a type foundry, largely through the encouragement of William Bowyer. 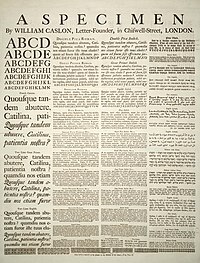 He died on 23 January 1766, and was buried in the churchyard of St Luke Old Street, though his name would come to be identified with an enduring style of Latin alphabet, Caslons first typefaces were what contemporary typefounders called exotics. His first Latin typefaces were a roman and italic cut in the pica size, Caslons typefaces were inspired by the Dutch Baroque types, the most commonly used types in England before Caslons faces. His designs influenced John Baskerville and are thus the progenitors of the transitional, Caslon typefaces were immediately popular and used for many important printed works, including the first printed version of the United States Declaration of Independence. 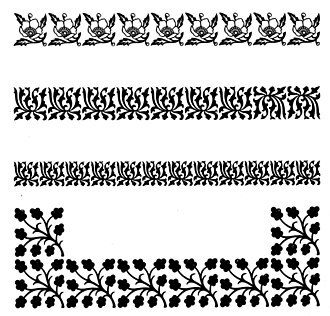 Caslons types became so popular that the expression about typeface choice, the Caslon types fell out of favour in the century after his death, but were revived in the 1840s. 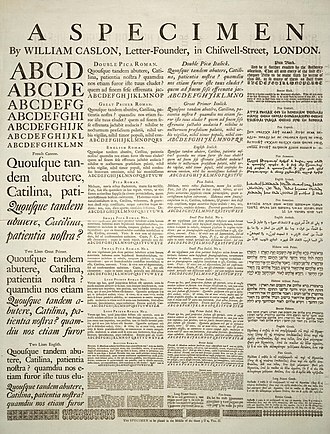 Several revivals of the Caslon types are used today. William Caslon founded the Caslon Foundry in 1739, the other half was purchased by John James, son of Thomas James. John James purchased at around 1716–1764, which became the leading English typefoundry of the 18th, John James, William Caslon I and Baskerville as the only three representatives of the trade in the country. William Caslon I had two apprentices in his Sheffield Foundry, Thomas Cottrell and Joseph Jackson and they started a foundry of their own in direct competition to their employer in 1757. In 1759 Jackson entered the Navy leaving Cottrell to carry on alone, Jackson left the navy in 1763 and continued to be employed in Thomas Cottrell, Neveils court 1759–1785 Foundry for a short time. 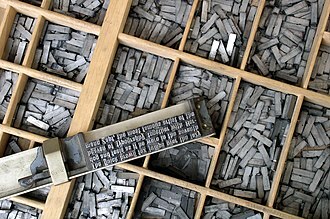 The Monotype system is system for printing by hot-metal typesetting from a keyboard. It is not necessary to have the number of each machine. 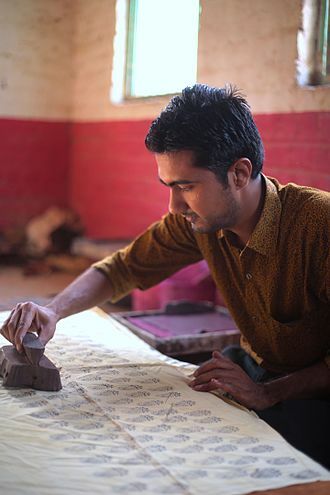 The Monotype caster casts individual letters, which are assembled into lines in a similar to classical movable type. This requires a more complex high-speed water-cooled casting mold, but only one matrix per possible character. A Monotype operator enters text on a Monotype keyboard, on characters are arranged in the QWERTY arrangement of a conventional typewriter. Thus, the typesetter moves his hands from one group of keys to another to type uppercase or lowercase, small capitals, italic uppercase or italic lowercase, and so on. When the text nears the right margin, a drum on the keyboard indicates codes which are punched on the tape with special keys to indicate how the line is to be justified. The tape is taken to a Monotype caster, which reads the tape, in 1890, he filed a subsequent patent, which covered the Monotype caster. In 1897, the Lanston Monotype Corporation opened a branch in England, a Monotype keyboard allows a keyboard operator to prepare a perforated paper tape, called ribbon, that will direct the casting of type separately from its actual casting. The keyboard on which the types is removable, as is a set of keybars under the keys. During operation, two sets of keys and keybars are placed in two side-by-side trays on the keyboard, the keybars are adjustable, so that the coding of the keys can be changed. Keytops are replaceable, so that the keyboard can be reconfigured and this is achieved by placing a rectangular array of brass matrices, each of which is one-fifth inch square, in a holder, called the matrix-case. 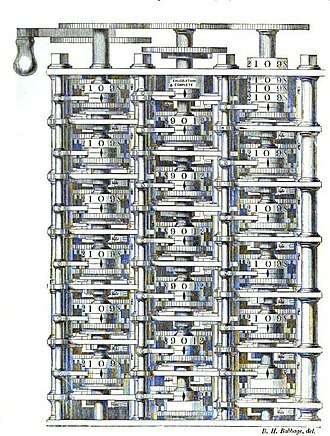 Originally, it contained 225 matrices, in 15 rows and 15 columns, versions of the Monotype caster expanded that first to 15 rows and 17 columns, and to 16 rows and 17 columns. The paper tape that controls casting contains 14 columns of holes that indicate the row of the matrix-case to be used, and 14 columns of holes that indicate the column of the matrix-case to be used. Originally, one row and one column of the matrix-case were indicated by the absence of a hole, when the matrix-case was enlarged, some columns or rows of the matrix-case were indicated by combinations of two holes instead. 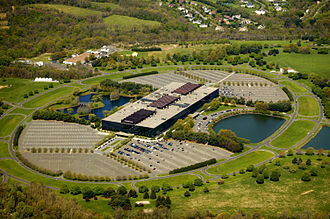 Information International, Inc. commonly referred to as Triple-I or III, was an early computer technology company. The company was founded by Edward Fredkin in 1962 in Maynard and it moved to Santa Monica, Culver City, and Los Angeles California. Triple-I merged with Autologic, Inc. in 1996, becoming Autologic Information International Inc, the combined company was purchased by Agfa-Gevaert in 2001. The company manufactured film scanners using special cameras fitted with photomultiplier tubes as the sensor, for digitzing existing films. 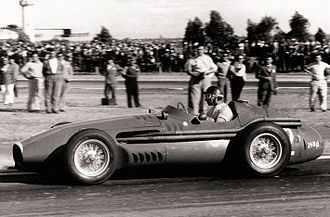 One such successful product of using their precision CRT technology was their FR-80 film recorder introduced in 1968. Although it was continuously under development over a period of more than 10 years, the second was a hand-print recognition system sold to the British NHS, which captured data from benefit forms. 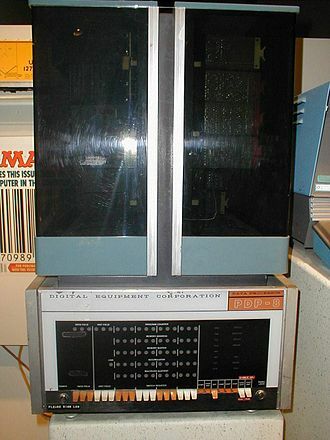 While none of the OCR research had any lasting impact, the use of PDP-10s directly enabled Triple-is involvement with computer animation. Triple-Is work in computer animation done by the Motion Pictures Product Group, is probably the most notable first from Triple-I and they created some of the first computer-generated special effects for major motion pictures, and employed a number of computer graphics pioneers. In 1974, Demos and Whitney convinced Triple-I to establish the Motion Pictures Product Group, in 1976, they scanned and animated Peter Fondas head for Futureworld, the first appearance of 3D computer graphics in a film. They created an early demo animation called Adam Powers, The Juggler and they were responsible for effects in the film Looker, and animation tests for films such as Close Encounters of the Third Kind and Star Wars. 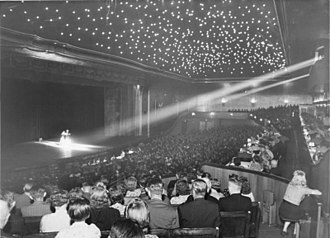 When Disney began production of the film Tron, they hired four companies to create the computer graphics — Triple-I, MAGI, Robert Abel and Associates, Triple-I and MAGI were responsible for the majority of the roughly thirty minutes of computer animation. Triple-I created the Master Control Program, the Solar Sailer and Demos left before the end of work on Tron, to found Digital Productions. 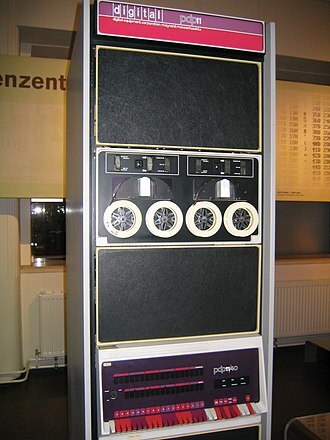 Partly due to their departure, Triple-I was unable to complete as much of the effects as planned, Triple-I sponsored the construction of the Super Foonly F-1, the fastest PDP-10 ever made. A typewriter is a mechanical or electromechanical machine for writing characters similar to those produced by printers movable type. 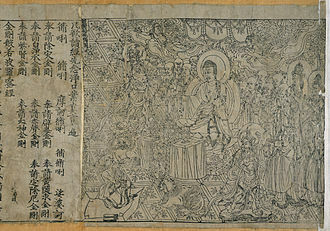 A typewriter operates by means of keys that strike a ribbon to transmit ink or carbon impressions onto paper, typically, a single character is printed on each key press. The machine prints characters by making ink impressions of type elements similar to the used in movable type letterpress printing. At the end of the century, the term typewriter was applied to a person who used a typing machine. After its invention in the 1860s, the quickly became an indispensable tool for practically all writing other than personal handwritten correspondence. It was widely used by writers, in offices. As with the automobile and telegraph, a number of people contributed insights, historians have estimated that some form of typewriter was invented 52 times as thinkers tried to come up with a workable design. Some of the early typing instruments, In 1575 an Italian printmaker, Francesco Rampazzetto, invented the scrittura tattile, in 1714, Henry Mill obtained a patent in Britain for a machine that, from the patent, appears to have been similar to a typewriter. In 1802 Italian Agostino Fantoni developed a particular typewriter to enable his blind sister to write, in 1808 Italian Pellegrino Turri invented a typewriter. He invented carbon paper to provide the ink for his machine, in 1823 Italian Pietro Conti di Cilavegna invented a new model of typewriter, the tachigrafo, known as tachitipo. 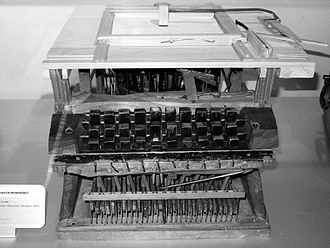 In 1829, William Austin Burt patented a machine called the Typographer which, the Science Museum describes it merely as the first writing mechanism whose invention was documented, but even that claim may be excessive, since Turris invention pre-dates it. 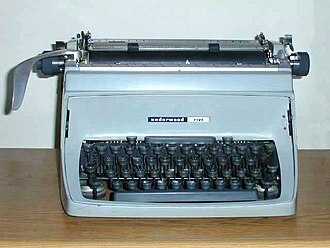 Even in the hands of its inventor, this machine was slower than handwriting and his promoter John D. Sheldon never found a buyer for the patent, so the invention was never commercially produced, because the typographer used a dial, rather than keys, to select each character, it was called an index typewriter rather than a keyboard typewriter. 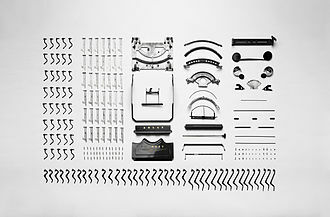 Index typewriters of that era resemble the squeeze-style embosser from the 1960s more than they resemble the modern keyboard typewriter, by the mid-19th century, the increasing pace of business communication had created a need for mechanization of the writing process. A paste-up for a poem from an edition of Alice in Wonderland, held in the Oxford University Press museum.